One large field is divided into smaller sections, by use of electric or permanent fencing. Provides new pastures on a regular basis throughout the season. Maximizes the quality of pasture and quantity of pasture growth. Minimizes parasite growth cycle & the impact of large animals on soil and plants. Cows are rotated at intervals, usually every 12-24 hours or up to every few days – depending on ratio of animals per acre and quality of land. This system works for any grass-feeding animals, but the key is to provide the best (first) feed to the most-needing animal. For example, a dairy cow gets the prime first feeding, the heifers would come through second for the less-plus clean-up feeding. Other animals (such as heifers, pigs, chickens, or goats) may follow to “clean up” the pastures by eating what the primary animals do not. Often rotational grazing is referred to as “New Zealand Pasturing” because most farms in New Zealand and Australia work as pasture-based diets for their ruminants. Therefore, they need to look for the best management for their pastures. It’s a cheap, healthy source of feed! Grass = free and doesn’t require expensive supplements. Most people with livestock have land and planned pasturing allows for maximized use of that land space. Cuts down on manure handling & wet living spaces – cows have a lot of manure & urine. Pasturing lessens the stress of manure handling, plus keeps your barns cleaner, drier, less smelly, and lessens condensed fly populations. Cow psychology: Cows always love to get to that greener grass on the other side of the fence! A cow “knows” when she is going to get a new pasture and she lets you know how excited she is about it! Equally disperses use of field – To make sure the animals eat up each section equally, rather than eating down some areas too much and not touching other areas. Pasture season can expand dramatically because cows thoroughly eat each section. Studies show that highly managed land can increase in productivity from 2.5 acres per cow down to as little as .5 (one half) acre per cow! Reduces growth of weeds by cutting the heads of weeds before the seeds can develop and spread. One alley protects the fields from “cow lanes”. Cows like to make paths and they lay down a lot. The alley that separates each lot suffices as their main “path” and an area for a central water trough. Cows can move in and out of the barn easily. An alley also keeps them from regularly laying in the same spots, which kills the grass underneath and causes dead spots. Our cows prefer to sleep in the barn in their freestalls at night except when the weather is unusually hot, then we pasture in the P.M. and let them sleep during the day in the freestalls with a fan blowing. If dry, the cows tend to prefer being outside 24/7 if they have protection from the hot sun or rain. Sambo Loveable loves pasture season! 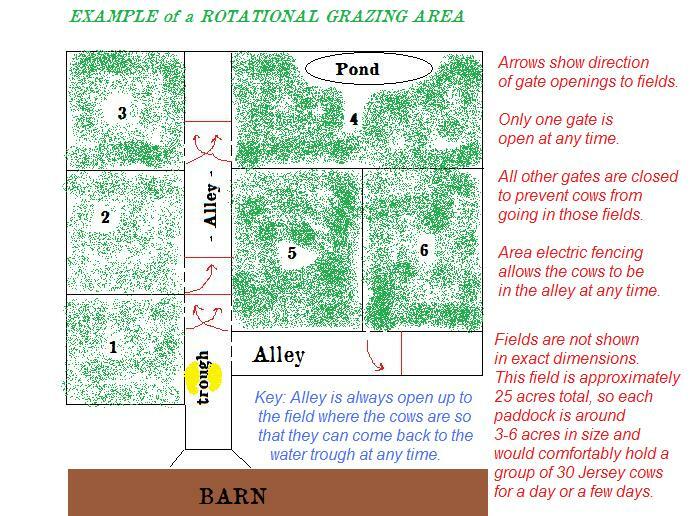 Make a diagram of your field(s) and come up with a plan to divide the acreage. Consider how many animals you have and how large the sections should be to provide enough room to move around without being crowded. Look for a place where permanent path can be made. An ideal footing is bark chips. The last thing you want is deep mud or muck for a cow to have to walk through. Try to find one common alley way and the least number of gates effective. not below 2-3″ or 4″ for new plants – move cows or dry lot! Allow cows to remove up to 50% of pasture material per feeding. Interval in each paddock is determined by growth of plants, usually faster in spring and summer & slower in fall. Clip pastures once they reach over 1 ft. tall if they are growing faster than cows can consume. Places where grass grows abundantly may benefit from haying a first cutting before pasturing cows on the field. CASE STUDY 1: 40 acre pasture for 100 milking cows and 20 dry cows, 12 paddocks divided evenly by group. Paddocks shaped to allow for tractor and brush hog to clip regularly. 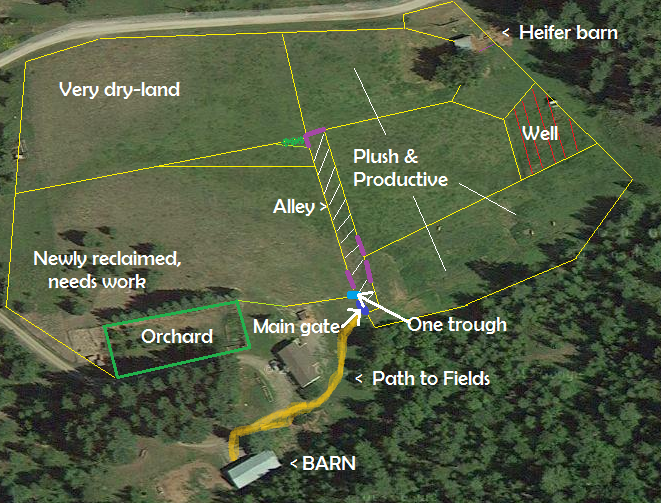 Two alleys coming out from the barn and automatic floats attached to a water trough provide all animals with water. CASE STUDY 2: 6 acre pasture for 2-4 milking cows, 2 steers, and 10 sheep, 6 paddocks divided by land-type to allow for 24 hour rotations. Dry land less-productive sections are larger, whereas heavy-legume wet land is in smaller sections. One central alley leads to all paddocks and animals have access to one trough at the top of the alley, which also helps farmer out when the cows need to come home (an easy time to catch them is while they come in for a drink!). Keep a water trough in the alley so cows can access water regardless of the pen they are in. In our fields, each section had a gate/opening. Keep the trough closest to the barn and open the gate to their pasture and swing it over so it blocks anything further up on the alley. That way, cows are limited to going into the one field or being in the alley at the water trough. Always, always, always offer lots of fresh water. Try to offer shade in each pen. Some farms grow trees throughout the pastures, at least one tree per pasture. Then they put up a simple two log fence around the tree to keep the cows from actually eating the tree (and yes, they will!!) Some fields are shaded on one side by trees or buildings. An artificial “shade” can be created as well, simply a pole barn with a roof or even a piece of plywood on poles is sufficient. Choose a rotation schedule that works well for your field. For our dairy, it worked well to let the cows out between milkings. On hot summer days, the cows stayed in the cool barn during the day and pastured overnight in the shade for cooler weather. The rest of the season (fall and spring for most of us) cows do well pasturing in the day time to get sunshine and Vitamin D and fresh air and bed down in the barn at night to sleep. Watch the weather. Said alternately: Watch the cows for weather predictions! If a storm is coming, the cows will huddle up in the alley or the field and will likely be standing up, acting somewhat agitated. They need to be brought back to the barn in that case. If the heat becomes too much, the cows will stop pasturing and will again want to come back to the barn. Sometimes, a run-in shed can be built in the pastures (like you see at horse farms), but for many, that extra cost is not as feasible as just bringing the cows back to a permanent barn dwelling. Caution: On new spring pasture, only let the cows out for an hour or two and gradually increase the amount each day. Sudden change can cause bloat and should always be avoided. Feed hay before allowing access to pasture, especially in spring & when needing to supplement pasture. For example, if the cows have been in for the evening, you can milk them and then let them back to the barn for an hour or so to eat some hay before heading them out to pasture. If your fields are limited, this can be helpful to prevent overgrazing. A brush hog is your best companion. Use the highest setting (perhaps 6+ inches high) and cut the grass on a regular basis. If you start seeing tall bunches not getting eaten, the grass needs cut. If the grass is growing too fast and you don’t have enough animals out to consume it, then you might just need to cut the field to bring it down to a more desirable level. Try to not ever let the grass get much over a foot high. If the grass gets seed heads or grows really tall, you will be limiting any further growth for the season. Shorter grass tends to be more nutritional, palatable, and continues to grow, so your cow will be getting more out of her pasturing. Looks plush, but this pasture needs to be clipped to maximize production and nutrition content! Even with rotation, you may not have enough pasture to last the year. If this is your situation, then prepare in advance by limiting pasture times and supplementing with hay. Overgrazing can cause serious long term damage to pastures. A little extra hay and some “down time” in the barn can save your fields from becoming depleted. If your grass gets below a few inches tall, it’s time to remove the animals until that area has grown back to 4-6 inches tall at least. Spring or fall harrowing scratches the surface, allowing new seeds to make contact with earth and breaks up old cow pies for better distribution of nature’s fertilizer. Rotating chickens through the pasture works similarly, just be sure not to keep them in one spot very long (more than a 12-24 hrs.). Consider whether irrigation is going to be necessary. If you have the ability to water your pastures, this both improves production significantly and can keep your grass healthy during stressful weather or as it goes dormant into wintertime. If nature does not provide rain, one or a few good waterings at the end of the season can protect plants from frost during the winter months. Check with your local extension office if you are concerned about irrigation rules in your county. WHAT plants are best for pastures? You can have your soil tested to help you determine what to add to the pastures, if you don’t already know. Ask your local feed store, labs, or extension office to find soil testing supplies. Soil tests for pH and nutrient levels to determine if/what your fields are deficient in (such as zinc, selenium, etc.) and what you might have to supplement onto the fields or in your cow’s feed. Also, make sure you know what kind of soil you have: loam, clay, sand, etc. Then you can learn how your soil will handle rain, drought, and other factors in nature and can help you find the best grasses to suit your climate. Clover: Clover is a favorite plant for cattle & farmers (they love to eat it, and we like how easy it germinates!). A pasture can have 40-50% legume growth for optimum nitrogen fixing (which means the plants actually pull nitrogen out of the air and “fix” it into the ground via the root system. The cow eats the nitrogen-fixing legumes and the manure helps return more nitrogen back the ground. Clover has a crown root system that is hearty and helps prevent erosion. The low laying crop resists trampling and wind damage. Clover reseeds itself, is long lasting, and is an easy keeper, working in warm, cool, dry, or wet conditions. We have used the Ladino and Alsike varieties. Pick a variety based on your type of soil, moisture levels, local availability of seed, and animal needs. White clover can be added to a field without tilling. If you know a rainstorm is coming, you can clip the field, harrow, seed in clover, harrow again, and soon you will have a great addition to your pasture! Fescue: Persistent growth throughout the pasture season. Soft and palatable. We used the Alta variety. Timothy —-> Slower maturing than other grasses, such as orchard grass. Even when older, it is more palatable than other grasses. Does well in different climates. 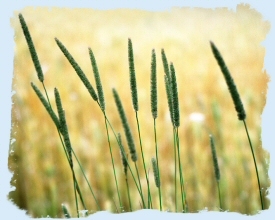 Local grasses: Depending on your area, a number of different local grasses grow. 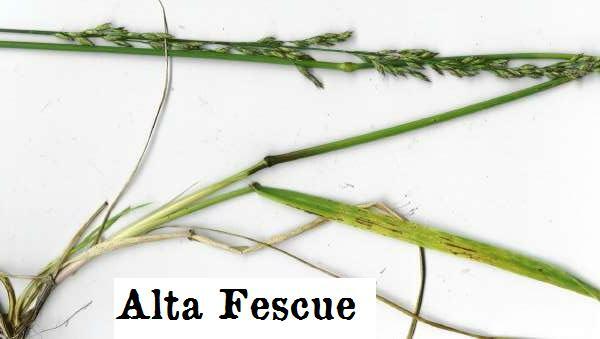 Contact your local extension agent to identify the different grasses in your pastures. We personally do not recommend rye or orchard grass for pasture because of their tendency to mature and head out too quickly. 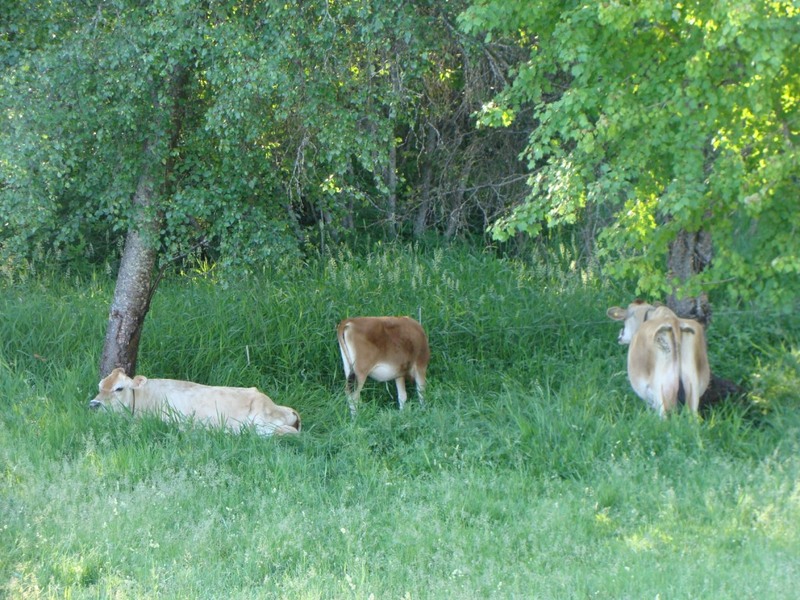 Early pastures are good, but require stringent management, which most small farms are not set up for. If you have the ability to brush hog regularly and want heavy production, these grasses may work well for you. WHAT plants should I use in hay fields? Alfalfa: Best protein source for cows, and reduces the need for grain. There are some old fashioned plants such as sainfoin or trefoil coming back into popularity that may suit your growing season better. Orchard grass: When cut at a young stage, orchard grass makes very nice hay when combined with alfalfa, 100% palatable for both our dairy cows and our sheep. Our favorite local hays are: 1st and 3rd cutting dryland alfalfa and 2nd cutting alfalfa x orchard grass mix. Our local season makes the “best” cuttings of hay during 1st: early June, 2nd: mid July and 3rd: late August or early September. Find out when your area has the best seasons. Then look for pre-bloom alfalfa, hay that has not been rained on, and properly cured (dried) to avoid mold. When seeding a new field, consider adding oats or barley to harvest first. They grow quickly and protect the other plants, also reducing weed growth. Makes an excellent supplemental feed, especially when cows are out on spring pastures. Grazing depends on sunshine and rain and temperature. Spring: Generally wet, pastures start out slowly, then boom in growth as the weather warms up and dries out. Watch how long the cows stay out each day. 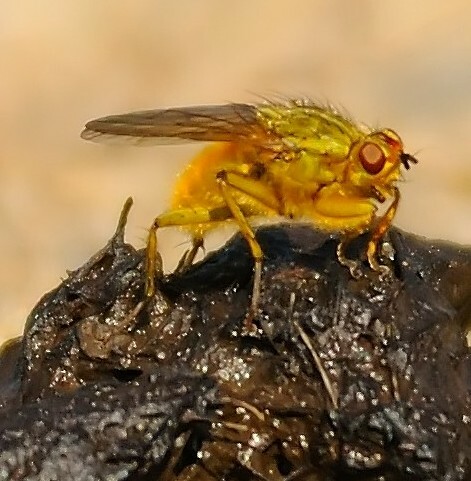 Also watch out for runny manure. Milking in the parlor was always “fun” come spring time!! (haha) You may have to rotate more frequently or cut the grass to keep it in the 4-6 inch range. Summer: Lots of sunshine keeps the grass growing well with lots of nutrition, IF rain/sprinklers can keep the pastures sufficiently moist. Watch out for sunburn on the cows’ udders! Try to keep each field equally eaten. We have one wet field that can be pastured twice as often as the drier fields. Fall: Declining growth, cooler weather, more rain. Some years, where irrigation can become critical. This is the time to monitor fields to prevent over-pasturing, which stunts plant growth and can cause increased parasite load in cows. Deworm cattle heading into the winter season. Winter: Don’t bemoan a resting period – your healthy spring pasture will reward you! This is so helpful! It’s less stringent than some descriptions I’ve heard where the whole kit and kaboodle of fencing has to be moved every day, along with water. This sounds like a method we could actually use on our very irregularly-shaped farm! Wow! almost all the information I needed in 1 pg! Thank you! I do have a question… how big are each paddock? If I am raising a milk cow, her calf and a bull? I am planning on following the cows with chickens then pigs. When would I bring back the cattle to the first paddock? Thank You! The size of the paddocks depend somewhat on how large your pasture is. Our paddocks are about 2 acres each in size. The smaller the paddocks (half acre or acre) the more evenly your pasture will be eaten, as you force them to concentrate on each area and not wander. If you only have a few animals, smaller sizes should work better. You might want to re-think putting pigs in your paddock, unless they have rings to prevent them from rooting up the soil. I’ve seen paddocks where people rotate pigs, and they make the ground very unsteady, I would worry about a cow breaking her leg. What we did was put our pigs in the bad areas, then we deeply harrowed the soil and leveled it, re-seeded, and let it grow before putting cows back in. 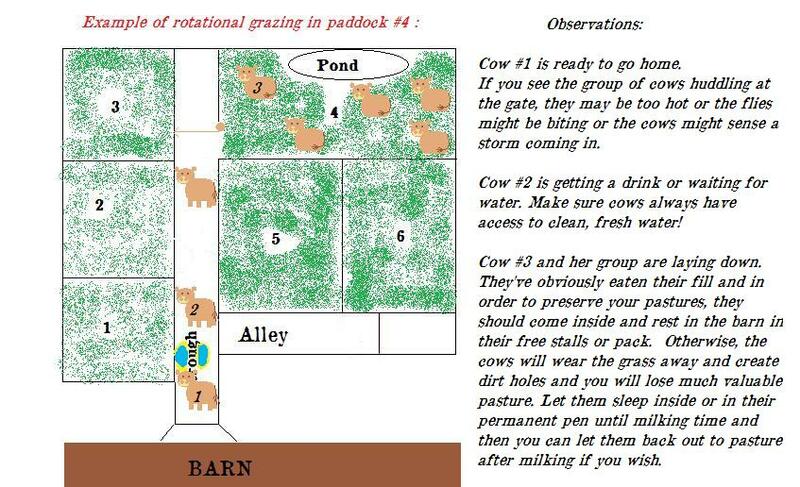 If you have several paddocks, you can try putting the cattle in one pen each day, then if you have 5-8 paddocks, just continually rotate them. The chickens should go right behind the cows, so they’ll break up the manure, the grass will have 4-7 days to recuperate, and the cows will have good grass in there next round. 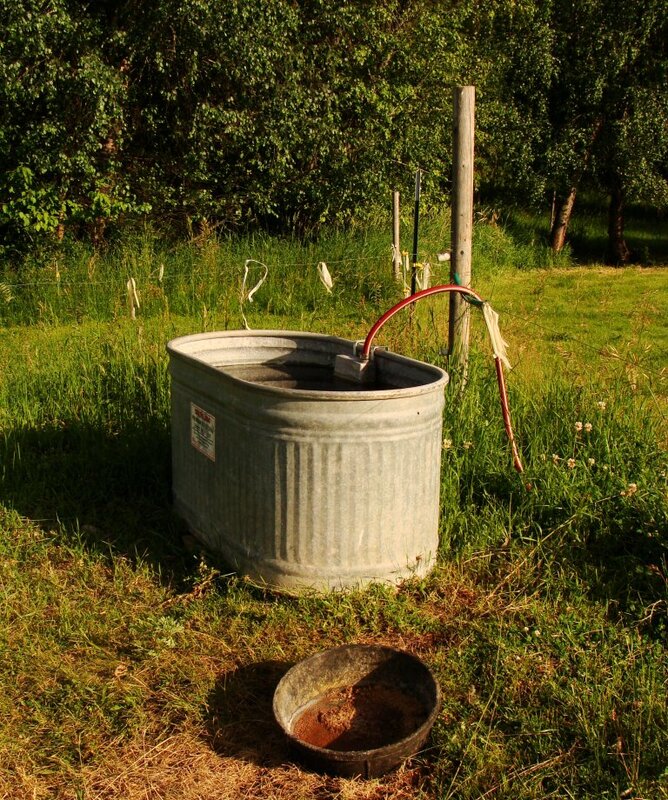 If you can irrigate after the chickens that would be stellar!